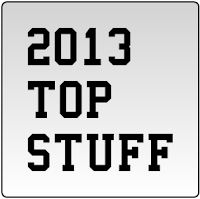 Following my top tracks of 2013, here are my top ten albums of 2013. Check out the handy YouTube playlist below, to listen along to tracks from each of the top ten - featuring the likes of Queens Of The Stone Age and Jon Hopkins. Bleached deliver one catchy punk-pop choon after another on this rip-roaringly enjoyable listen. The energy of the band on 'Ride Your Heart' is infectious and while it won't win any marks for originality, there are hooks aplenty to grab the attention throughout this no fuss, all fun record. One of the few artists on the Mercury Prize shortlist that deserved their nomination, this has been a breakout year for Jon Hopkins. Inspired by the story arc of a night out, there is a warmth running throughout 'Immunity' which makes it feel like you've been given privileged access to Hopkins' own personal world. An impeccably crafted album. The strength of the single 'Song for Zula' has deservedly brought this very impressive record to wider attention. While Phosphorescent's Matthew Houck may have previously recorded a Willie Nelson tribute record, this is no straight-forward country record, adding electronic beats and programmed strings to heighten the impact of his pastoral tales of heartbreak. While I've always appreciated Nick Cave and the Bad Seeds, I'd never really got into them. That changed with Push The Sky Away, which struck a chord with me. The record is stripped back compared to his previous records but that's the genius of the album as it draws you in with its subtlety. There's no need for Grinderman-esque shock tactics from Cave as the music is powerful enough in its own right. A late- career masterpiece from one of rock's premier storytellers. I often find I know I've listened to a really good record when a few weeks later I can still remember exactly where I was when I first heard it. Haw is one such beguiling record with a sound that has charms you can't fail to succumb to and want to wrap yourself in. The album impressively draws together a variety of musical styles covering folk, country, gospel and soul and the arrangements are intricate, drawing you into their stories of love and devotion. Magical. Despite the myriad of guest stars and departures, …Like Clockwork is one of QOTSA's most cohesive efforts yet. Like all quality records, its seductive potency grows with each listen. While their signature stoner desert rock underpins the record, Josh Homme has successfully broadened the band's sound, opening up a new direction from a group which was threatening to become entrapped by its own mythology. While you can never call Bradford Cox's music predictable, whether under the guise of Deerhunter or Atlas Sound, he consistently produces brilliant records. Monomania is yet another stunning addition to his already very impressive body of work. Despite the distortion that litters the record, it's his most accessible album yet as the instant melodies shine through leaving a lasting impact. While their knack for delivering bouncy indie-pop has never been in question, some quarters have (unfairly) dismissed Vampire Weekend as a preppy novelty band. Those critics have been silenced with 'Modern Vampires' which finds the group wrestling with weighty issues like faith and age. The band's sonic smarts are still there with the album holding together beautifully but lyrically they've stepped it up significantly. As someone in their late 20s too, I found myself relating a lot to the themes explored and while the record doesn't try to offer any answers, it comes across as both warm and comforting. Vampire Weekend now have added heart to their songwriting, and they're all the better for it. MCII shows off Cronin's prodigious songwriting talent, delivering one great track after another. It's hugely impressive, a power pop classic that continues the heritage of Nirvana and Weezer. Cronin's biggest trick is to deliver such brilliant melodies that make the record both feel contemporary and classical at the same time. Rarely are albums as inviting as this - you won't hear a more enjoyable record this year. Suede seemed to have achieved everything in their career. A great debut (Suede), an all-time classic (Dog Man Star), a superlative pop record (Coming Up) and a fantastic b-sides collection (Sci-Fi Lullabies). Yet, the misfiring 'A New Morning' damaged their critical and popular standing hugely. However, Suede have always been at their best when they've had something to prove. Having reestablished themselves on the back of their storming live reunion shows, Suede duly delivered a comeback classic this year with 'Bloodsports', restoring them to the vanguard of British guitar music. Based around the lifeycle of a relationship, Bloodsports is a perfect mix of stomping anthems and gorgeous torch ballads. and represents the sound of a band grasping their second chance with a vigour that's peerless.